ISO100 HYDROLYZED is a super premium combination of hydrolyzed whey protein isolate and whey protein isolate – the most advanced formula from DYMATIZE. Through enzymatic hydrolysis whey protein isolate is broken down into amino acid chains, which makes it easy to digest. 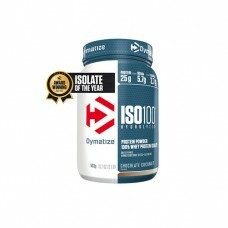 ISO100 HYDROLYZED is a perfect choice after and even before exhausting workouts. Free from sugar and fatit’s super lean with less than 116 kcal per serving when mixed with water. Hydrolized whey protein isolate (milk) (47%), whey protein isolate (milk) (44%), fat reduced cocoa powder, emulsifiers (sunflower lecithin, soy lecithin), salt, flavourings, flavour enhancer (potassium chloride), sweetener (sucralose). - 1-2 portions per day. Enjoy prior to workouts, after workouts or anytime you desire a high- protein drink. - As part of a varied and balanced diet and a healthy lifestyle.